Join us this Sunday June 29 from 1-3:00 & observe Adair apply approach grafts on a black pine. He will be working on a beautiful large black pine which has become too lanky and create future new branches. In Japan, the black pine is considered the best species for bonsai. In this country, many are afraid to try them, primarily because of the long needles. Actually, the needles are easy to reduce in length, once you know how. Light pruning and wiring/styling may be done during the summer. Late fall is the time to do major pruning and styling, as well as more needle work. Late winter/early spring is the best time to repot Japanese Black Pine. Your teacher, Adair Martin. travels to California three times a year to study Japanese Black Pine with his sensei Boon Manakitivipart. 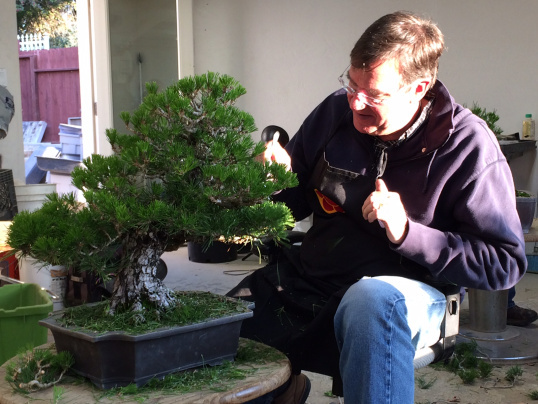 Adair works on Boon’s trees as well as his own that he keeps at Boon’s garden in California. The techniques you will learn are appropriate for all hobbiests whether you have been doing bonsai for 40 years like Adair, or just getting started.